With a name like “laying hen,” you might think the chickens at Dakota Layers near Flandreau, South Dakota, are just sitting around all day. Well, technically, they are, but they have a pretty important job that requires them to stay off their feet. The 1.3 million hens are responsible for laying more than 90,000 dozen eggs each day (at full capacity), which means they need healthy food to fuel their bodies. According to Brandon Gibson, manager for Dakota Layers, there’s a science to keeping hens happy and consistently laying high-quality eggs. It all starts with what they eat. No off-the-shelf feed brands will do for these ladies. They get their own special blends delivered right to them daily, which requires teamwork up and down the ag supply chain. The foundation of the feed for Dakota Layers’ hens comes from corn and soybeans grown by farmers in South Dakota, Minnesota and Iowa that is processed locally into meal. Other ingredients depend on what the hens need to be healthy. Soybeans. Soybean meal is about 15 percent of the feed mix and provides hens with important proteins and amino acids they need to lay nutritious eggs. Corn. Ground corn is an excellent source of energy for the birds and contributes to the yellow color of the pigment in the egg yolk. Corn contributes more than 50 percent of the feed mix. The next time you crack open an egg with a vibrant yellow yolk, you know the chicken enjoyed a diet rich in corn. Distillers grains. 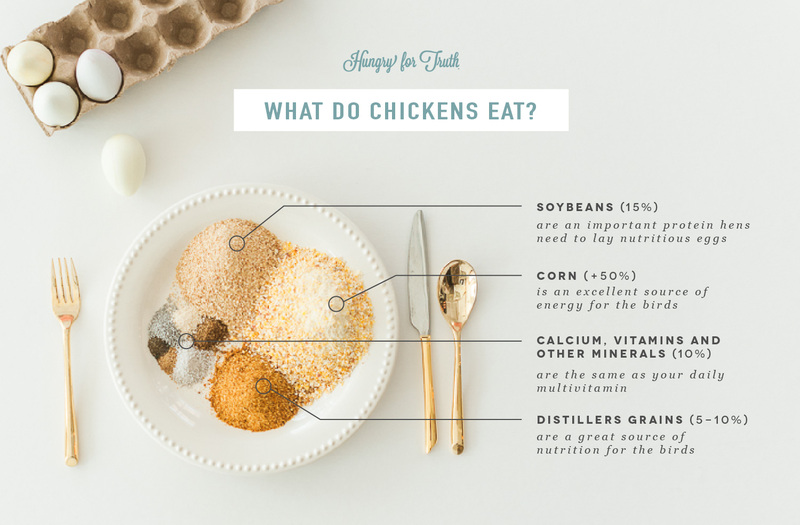 In addition to ground corn, chickens also eat corn in the form of distillers grains – 5-10 percent of the mix – which is a byproduct from creating ethanol. It turns out corn that doesn’t become a renewable fuel is a great source of nutrition for animals. Calcium, vitamins and other minerals. 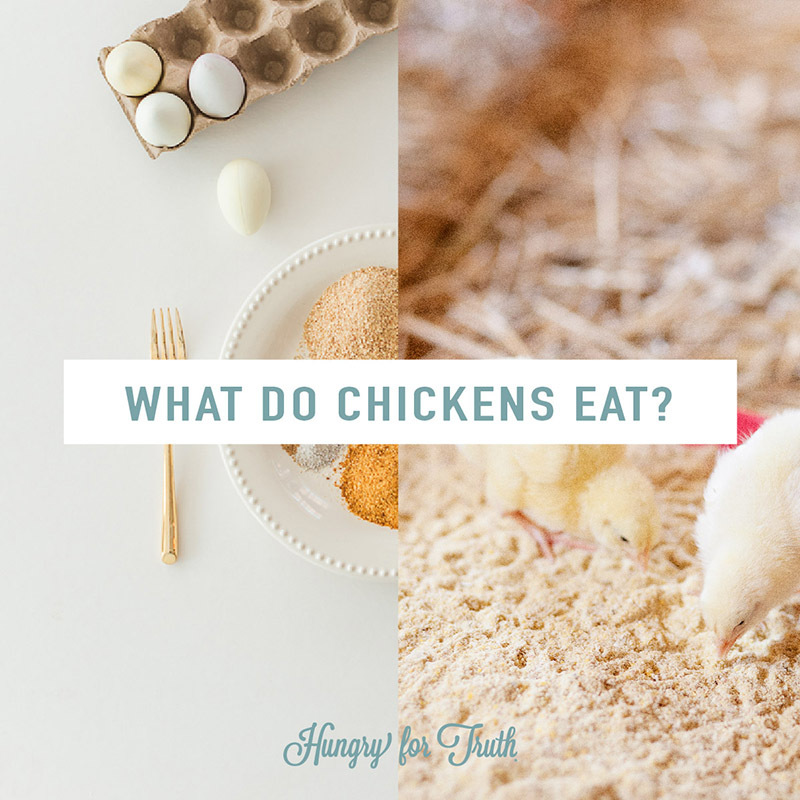 The remaining ingredients in chicken feed, about 10 percent, are the same vitamins and minerals you take in a daily multivitamin. The only exception is vitamin C, which is a deficiency unique to humans. One mineral that’s especially essential to hens for egg laying is calcium because that’s what eggshells are made of. “Since hens typically lay in the morning, the shell is the last thing put on at night while they sleep. Large particle limestone is really important to make sure it’s a good shell,” said Stacy. Just in case you’re wondering, it typically takes just over 24 hours to make and lay an egg. Once Brandon and Stacey settle on the feed formula, she sends the recipe to Darren Ponto at New Vision Co-op in Worthington, Minnesota, for testing, mixing and delivery. He makes sure they check each ingredient to confirm its quality before blending the feed. Since New Vision is the sole feed provider for Dakota Layers, Darren is also in charge of making sure it gets there on time. New Vision Co-op hauls approximately 3-5 trucks of feed per day, five days a week with each load weighing approximately 31 tons! A missed or late delivery could throw off the egg laying schedule and ruffle the feathers of those hungry hens. The next time you grab a carton of Dakota Layers’ eggs at Hy-Vee in Brookings or eat a bronco omelet at the Phillips Avenue Diner in Sioux Falls, consider the precision that keeps the hens behind those eggs happy and healthy. There’s no time to “lay” around when it comes to feeding a hungry flock. Want to read more farm-to-table stories? Here are some journeys from the farm to your fork.